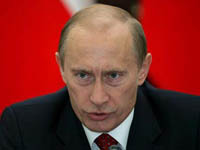 Russian Prime Minister Vladimir Putin demanded the Russian armed forces be equipped with modern weapons during a government meeting to discuss Russia's 2011-2020 military program late on Tuesday. "The Army should have at least 30% modern weapons by 2015, and at least 70% by 2020. We are going to put the necessary finances behind this," Putin said, adding that "ineffective expenses" would not be tolerated. Putin's statement comes after Russian military officials last week revealed plans to bring into service the first batch of its new fifth-generation stealth fighters in 2015. Russia is currently in talks with France on the possible purchase of a Mistral-class warship, worth 400-500 million euros (around $600-$750 million). "Essentially, we are talking about the timeframe, and what systems we should use to strengthen the Army and the Navy," Putin said. "In line with the plan to develop the armed forces, the main emphasis will be laid on nuclear deterrence, space and air defense systems," he added. RIA Novosti has contributed to the report.